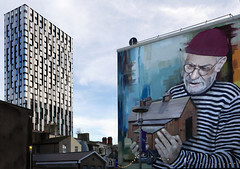 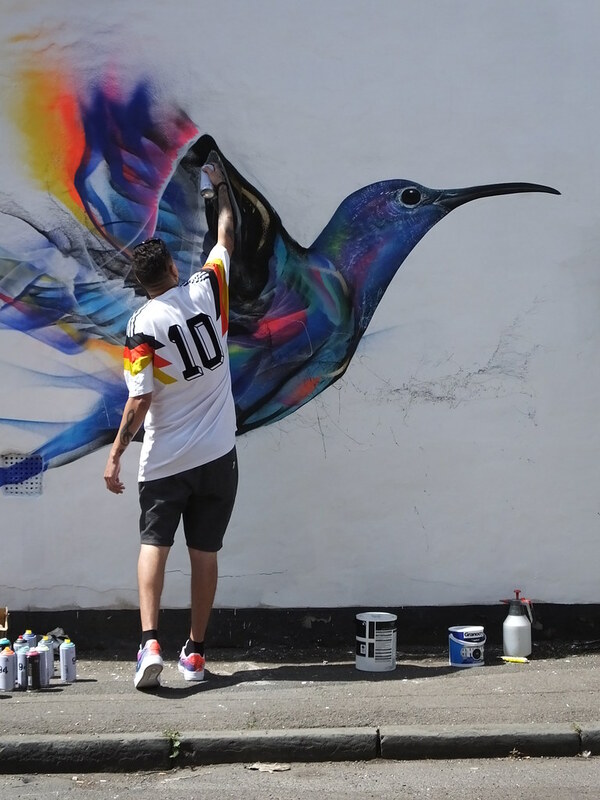 The yearly street art and graffiti festival ‘Upfest’ held in Bristol attracts a whole wealth of talent from across the UK and from across the whole world too. 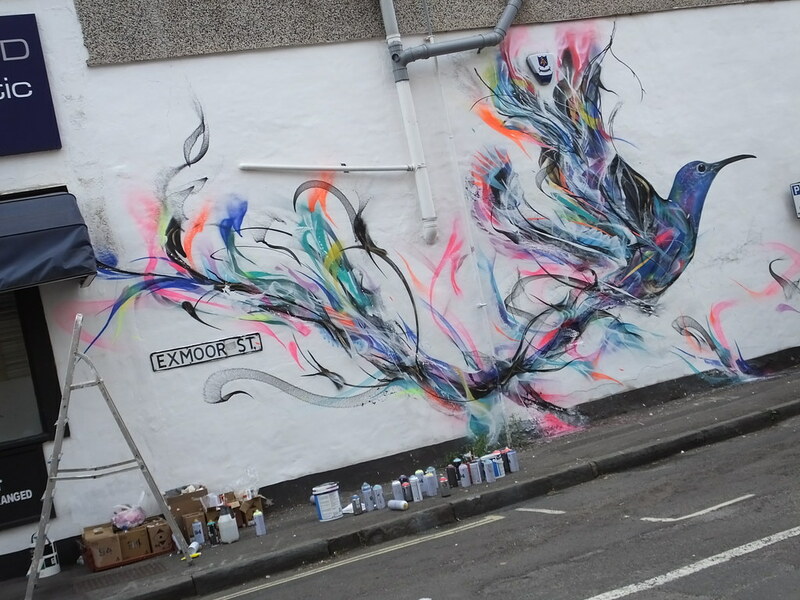 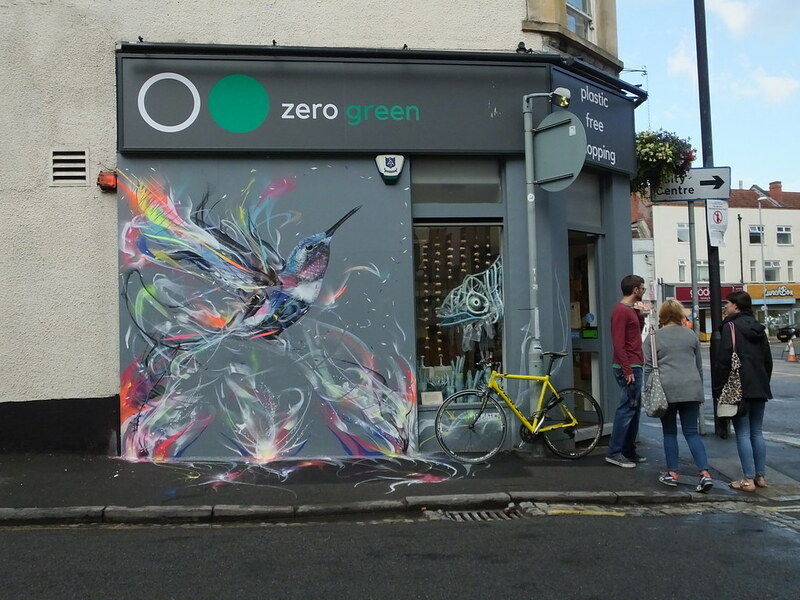 Born in Sao Paulo artist L7M or L7 Matrix arrived to bring his explosion of colour to a very white wall on Exmoor Street in the Bedminster part of Bristol. 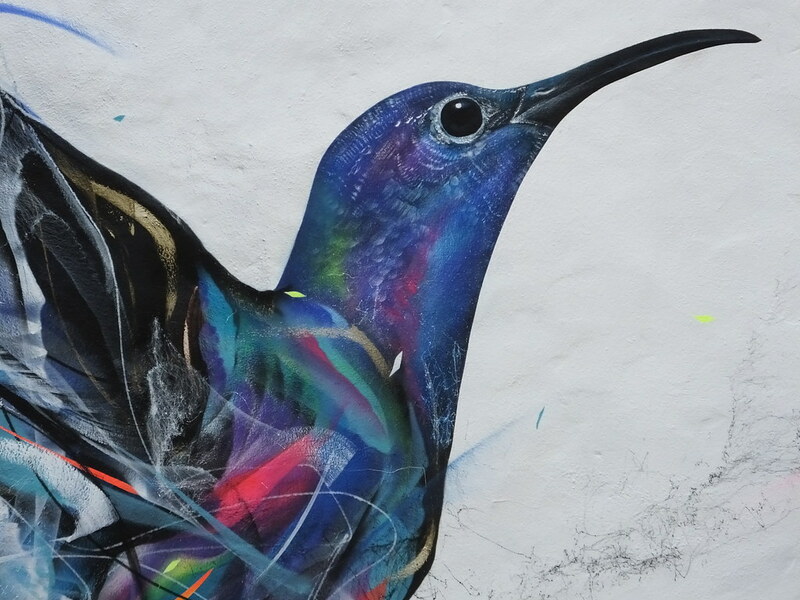 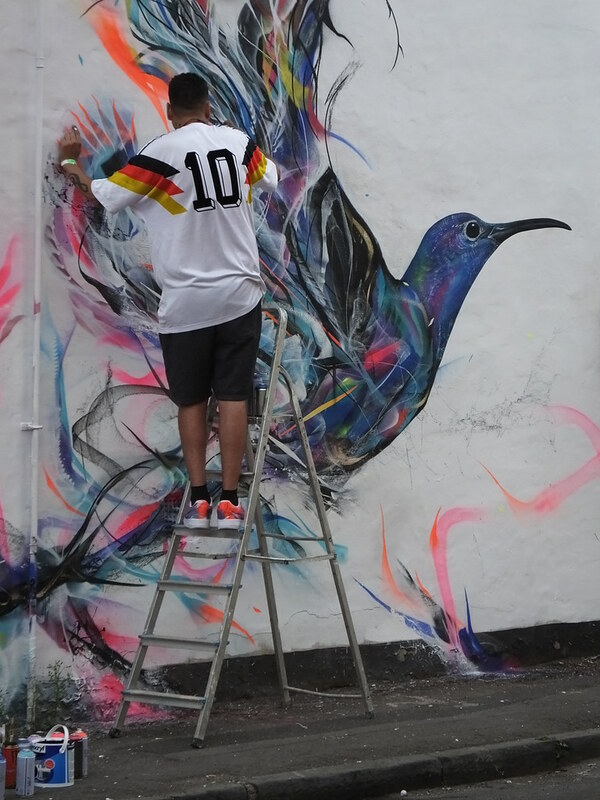 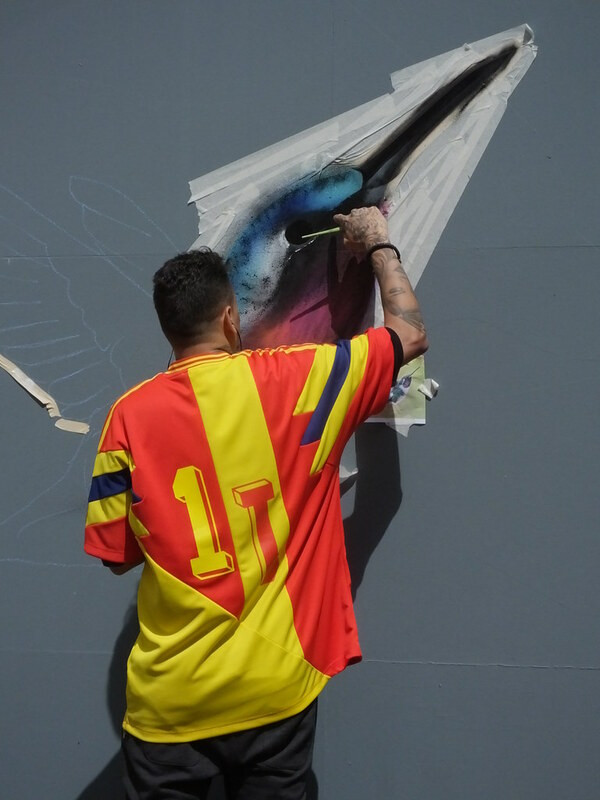 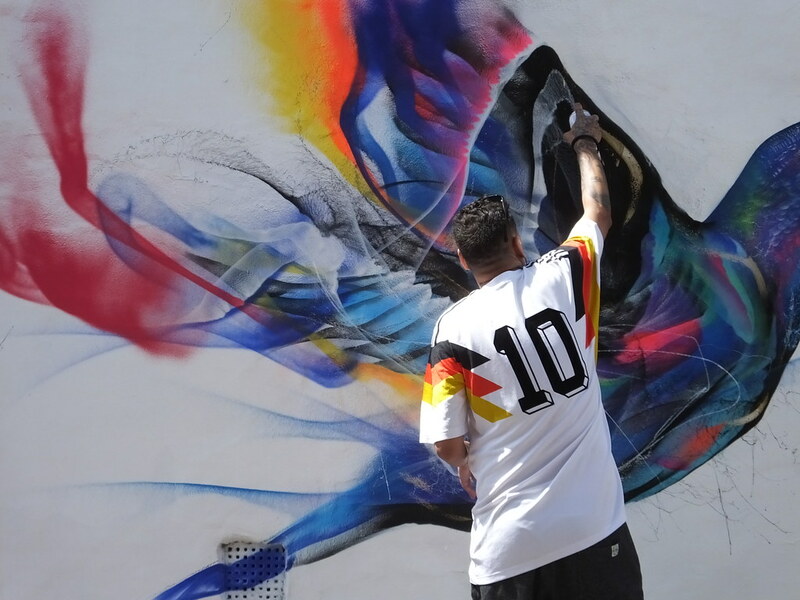 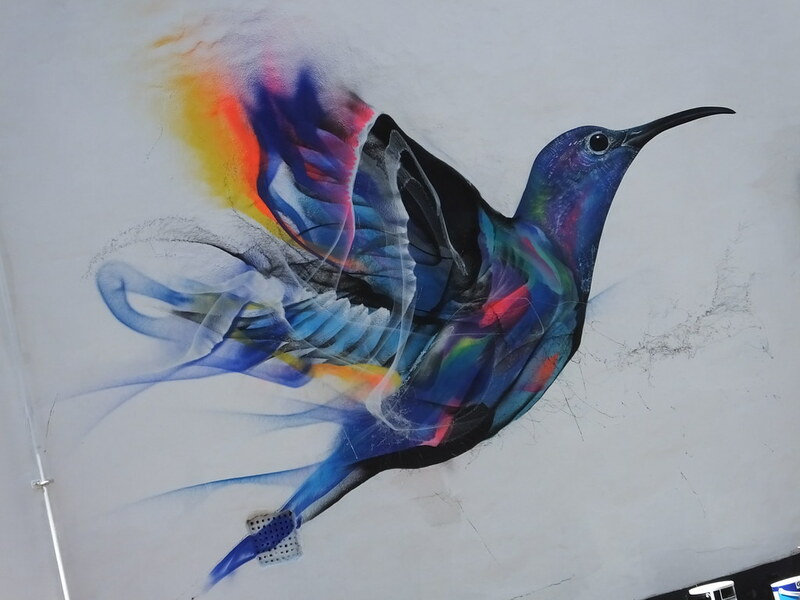 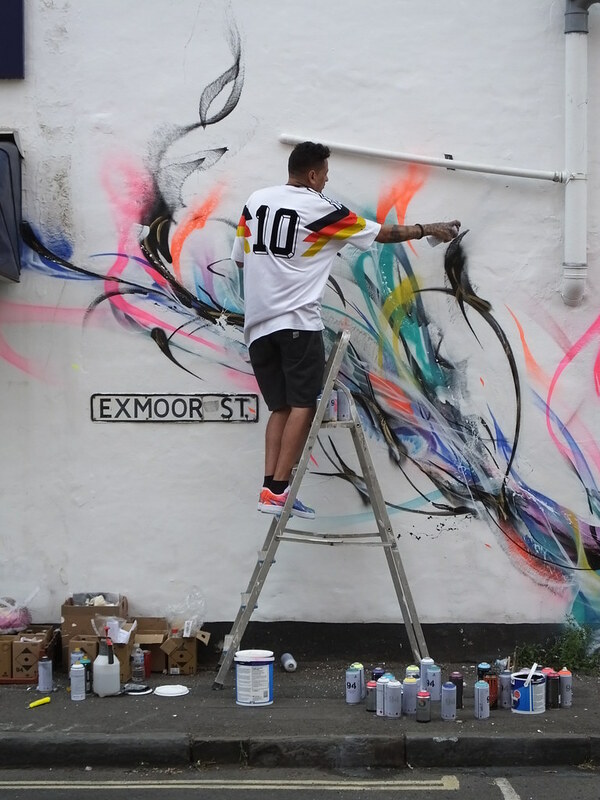 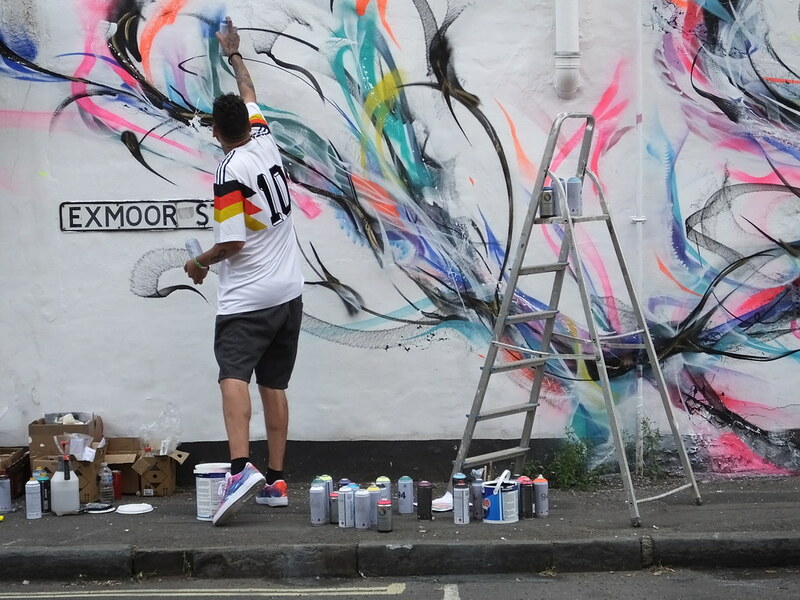 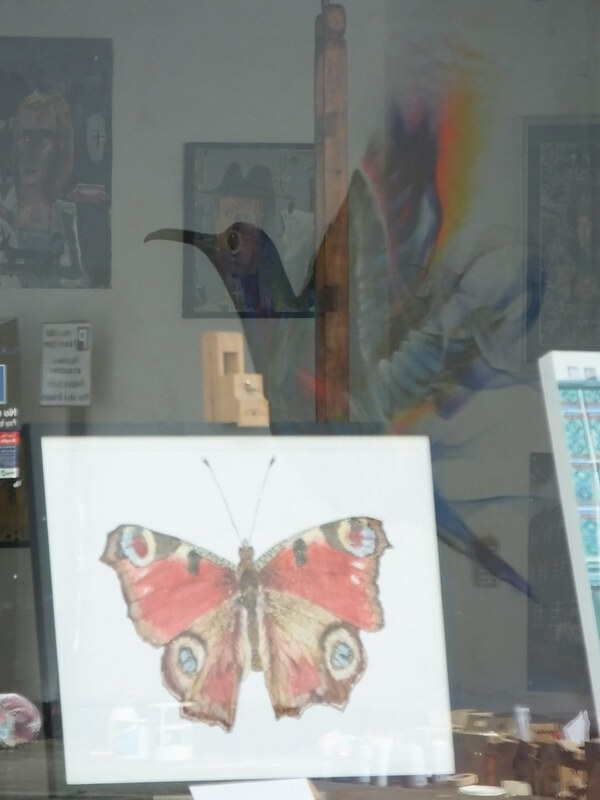 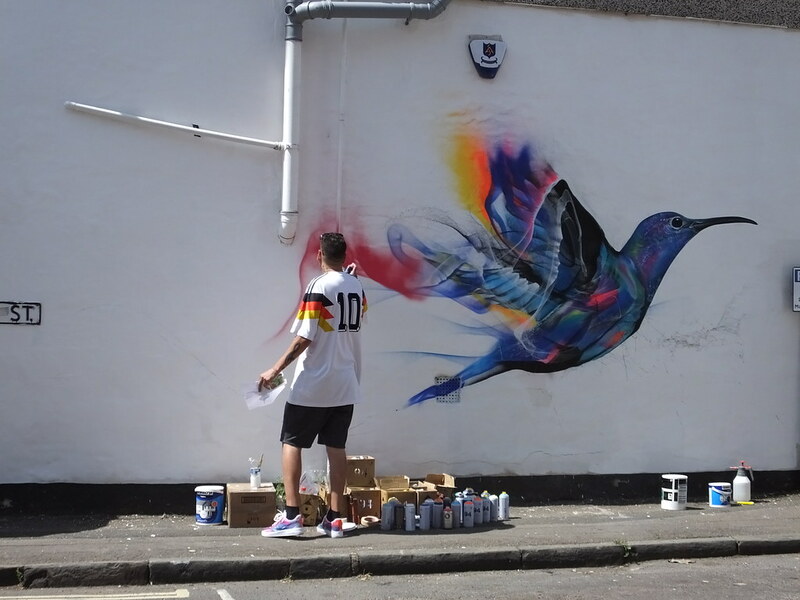 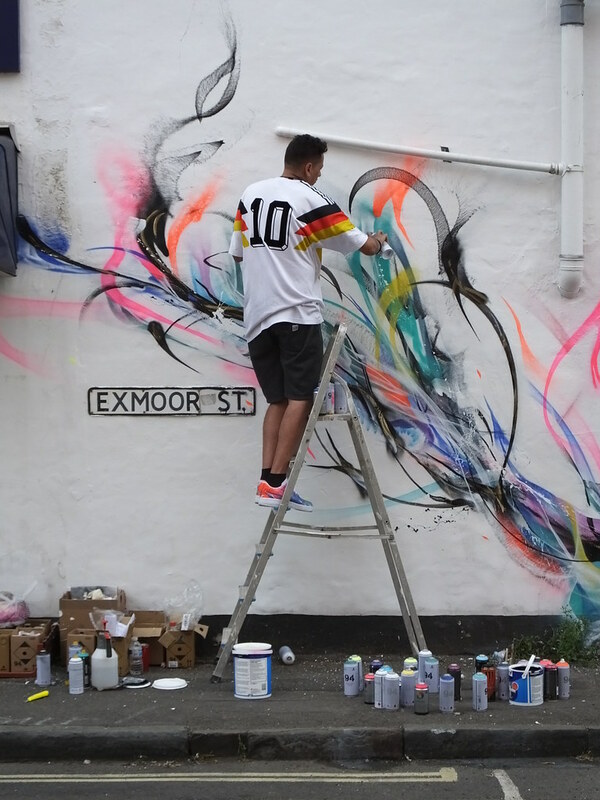 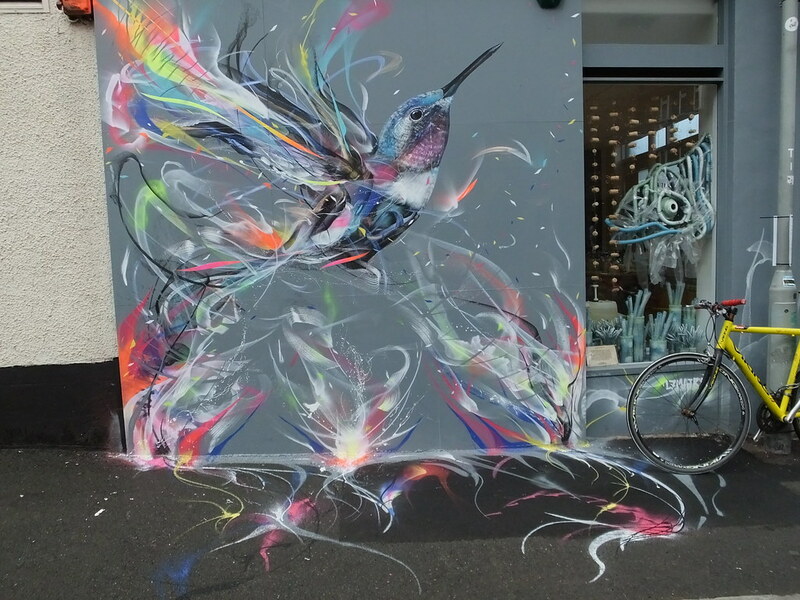 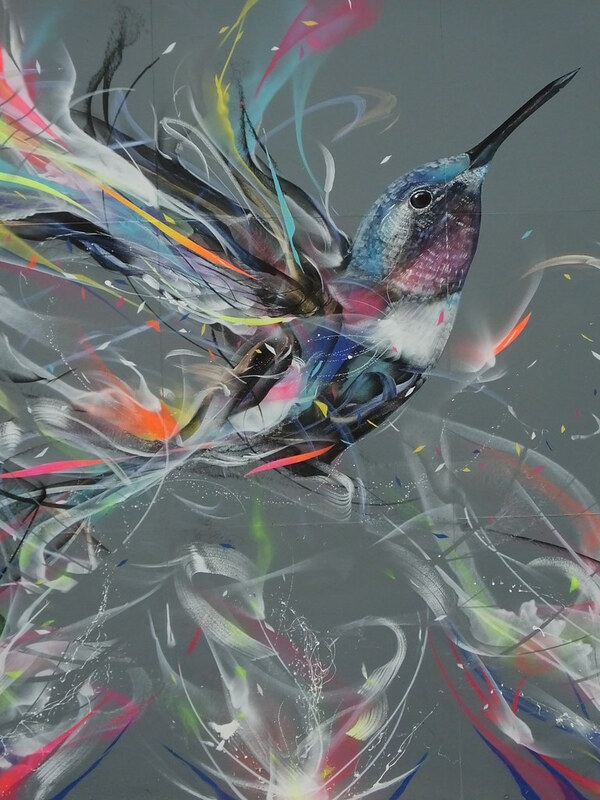 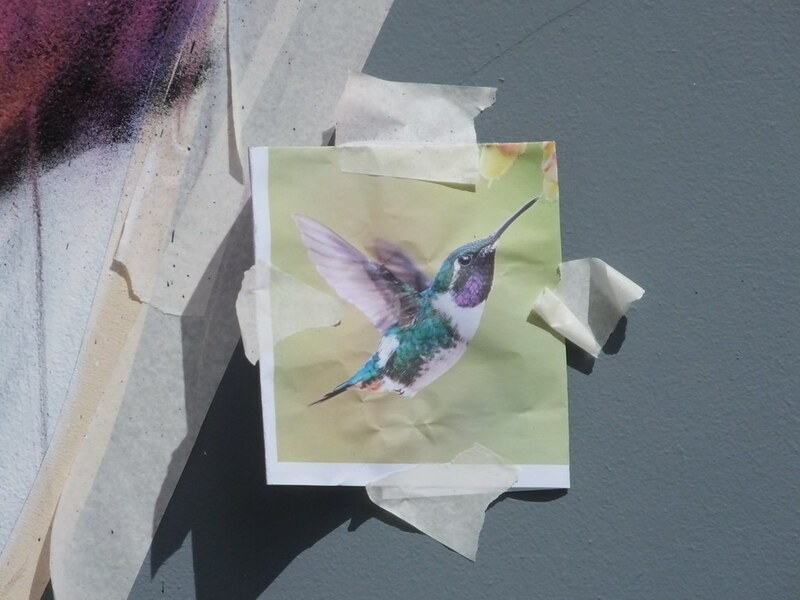 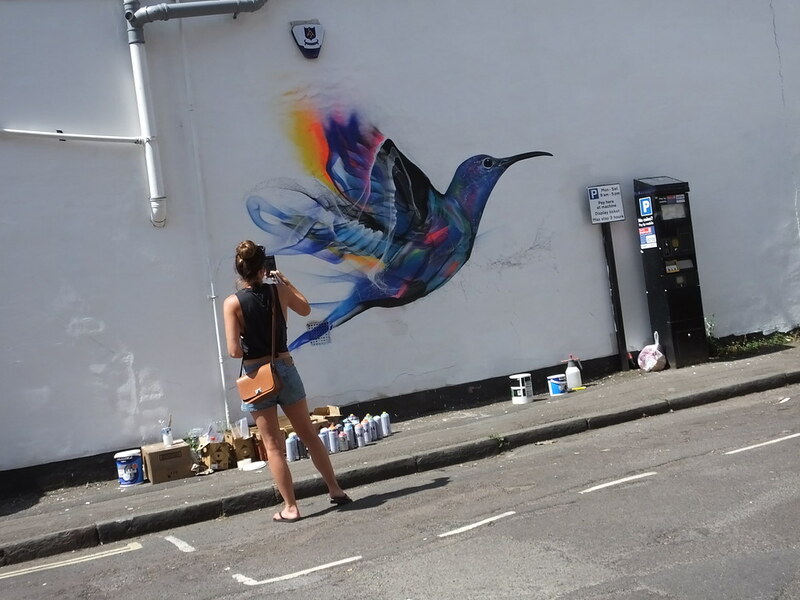 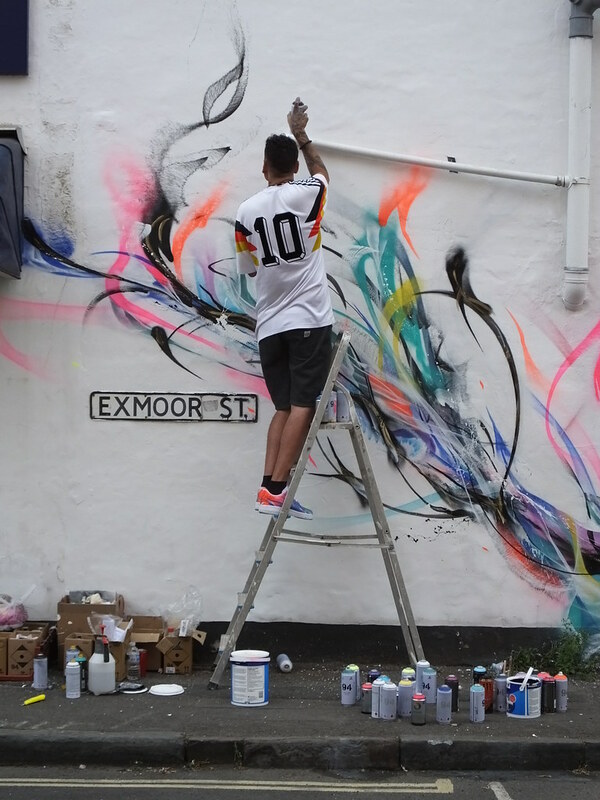 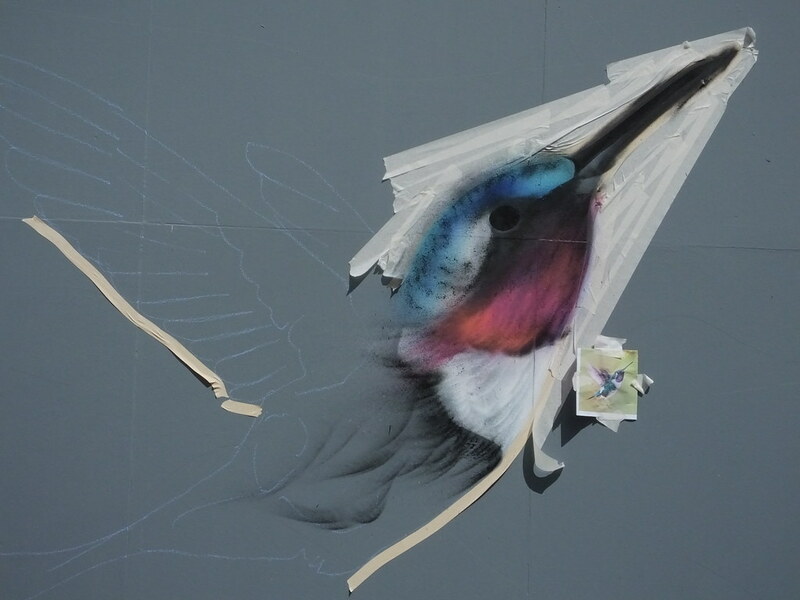 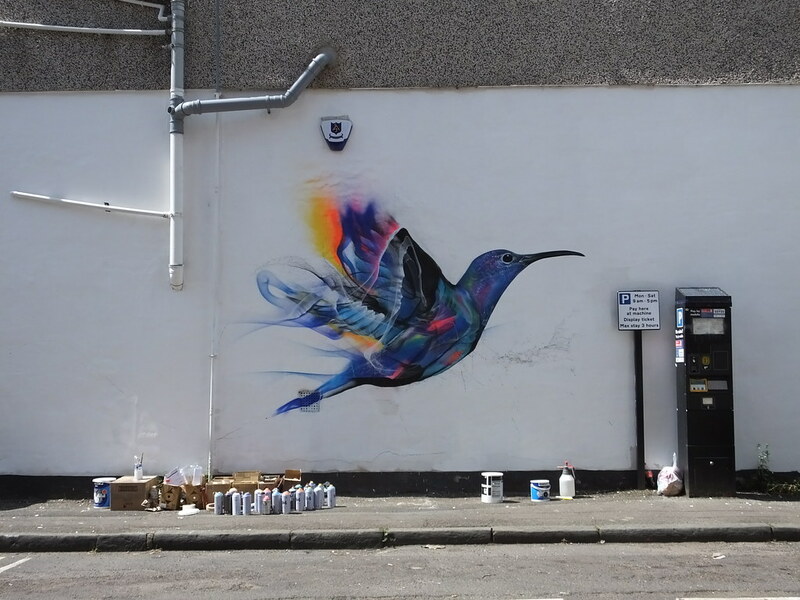 A colourful humming bird graced the wall and the artist continued working to bring his creation to even more life by adding glorious swirls and splashes of colour eminating from the bird. 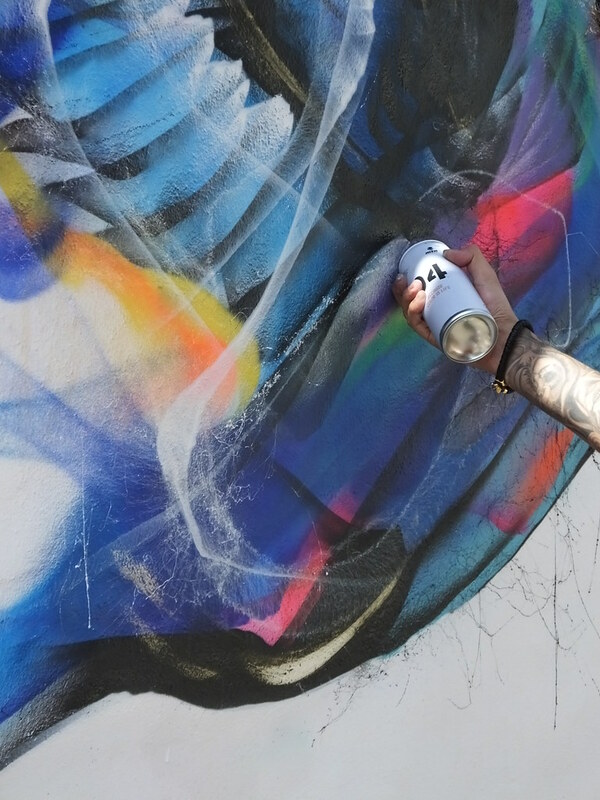 It was mesmerising watching such a talent at work growing his creation even bigger and bigger with such flowing movements of the spray cans. 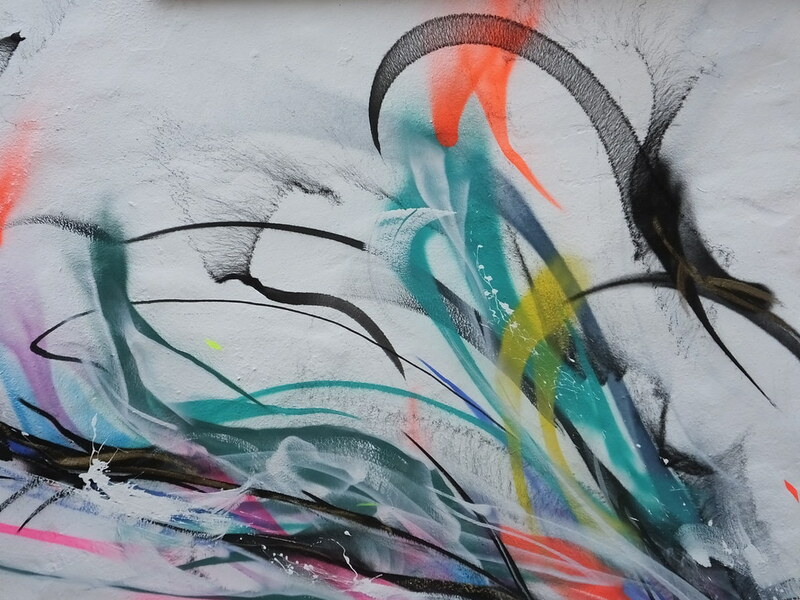 A variety of nozzles were used to give the amazing different spray effects. 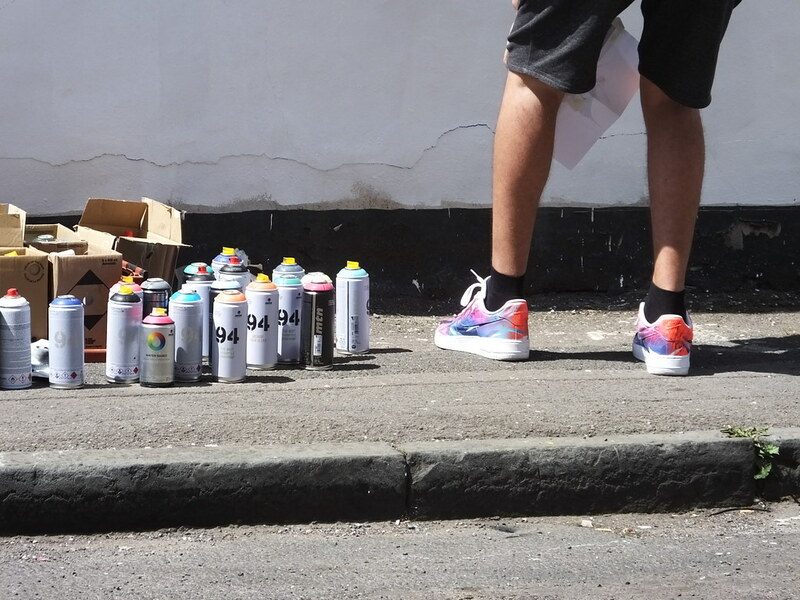 It was interesting to spot that his colourful footwear payed homage to his work too! 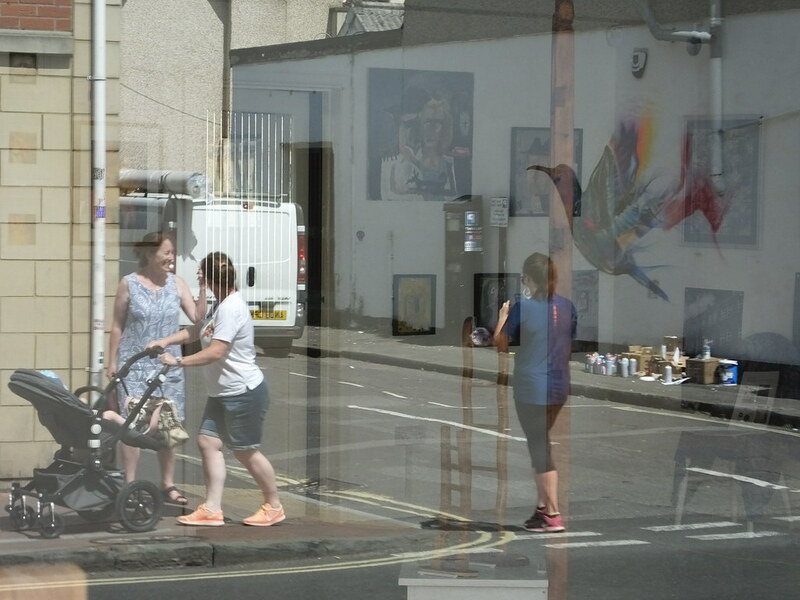 Whilst he was hard at work daily life continued in the street with other people going about their business… just like these carpet fitters! 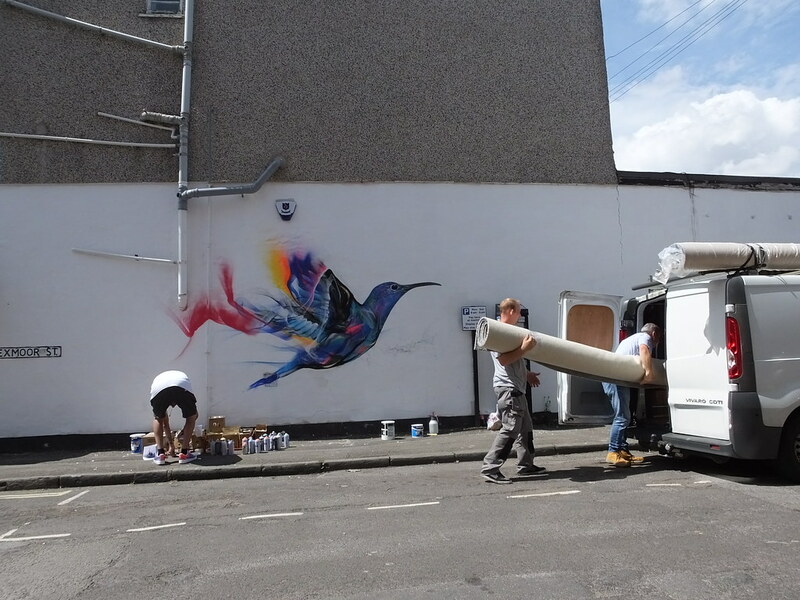 Returning later in the day and the work had grown substantially – but this was still far from finished! 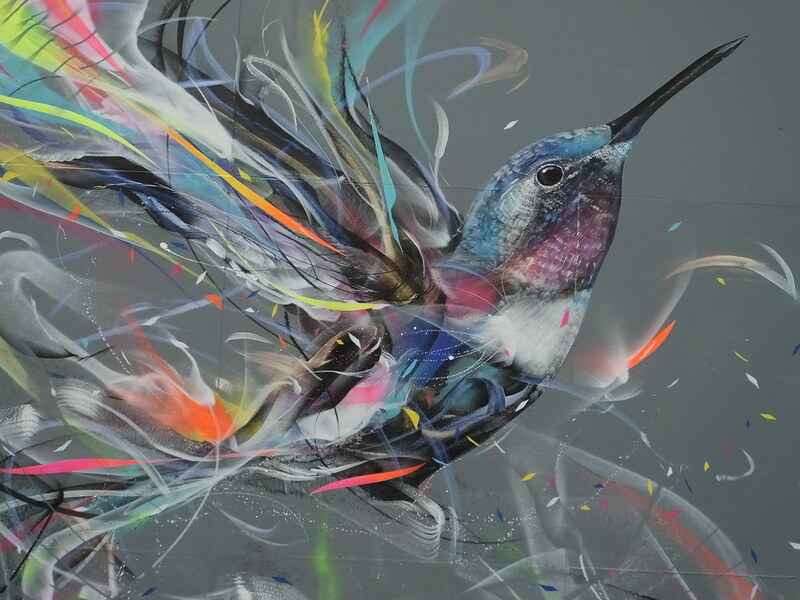 “Everything generates the chaos, from the mixture of outlooks and feelings to the materials and medias utilized.” – L7M website. 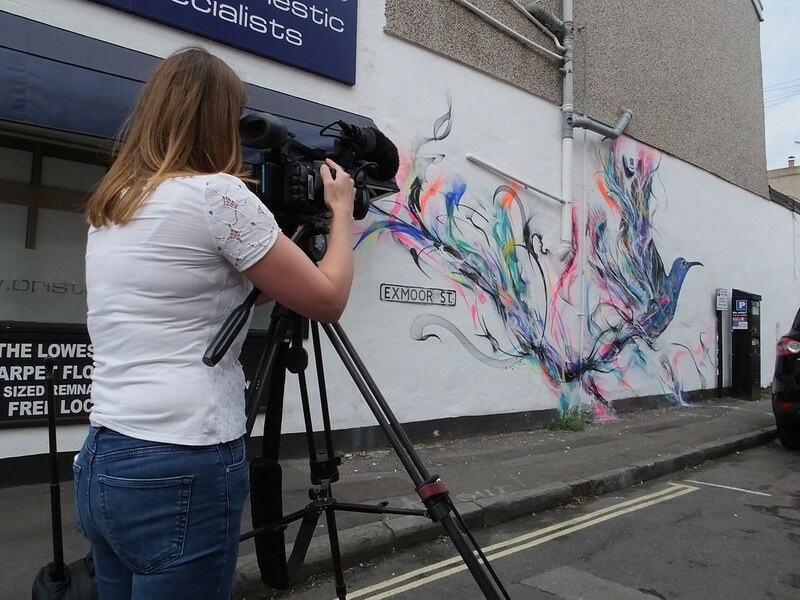 Crowds gathered to watch L7Matrix at work and even ITV News turned up to film him in action too! 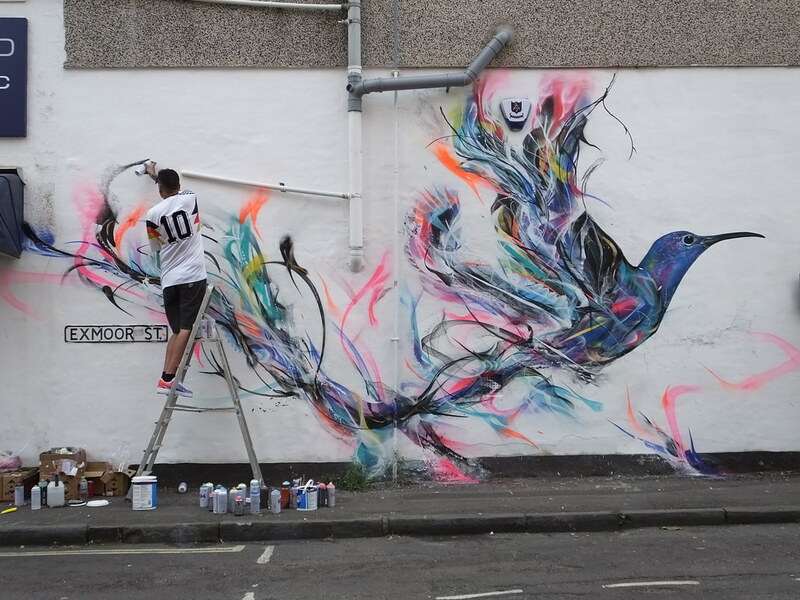 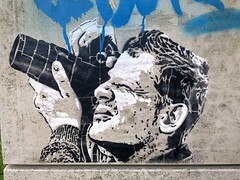 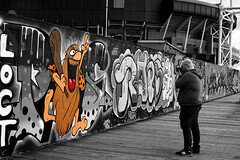 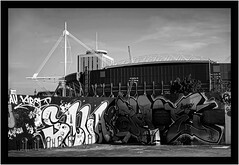 Such a stunning piece of work with some street art hunters spending most of the day just in this position watching him at work. 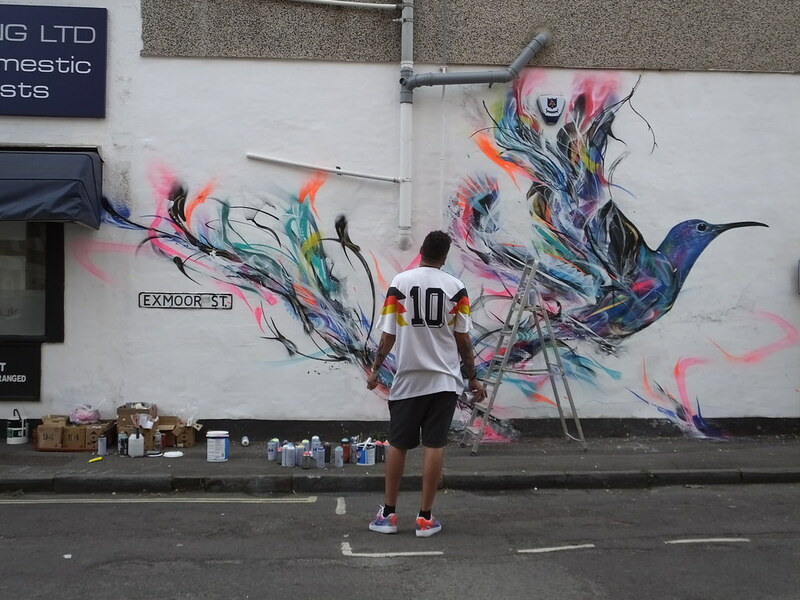 Only the artist will know when he is finished! 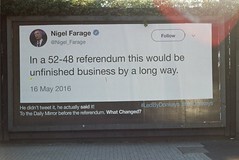 Surely this was it??? 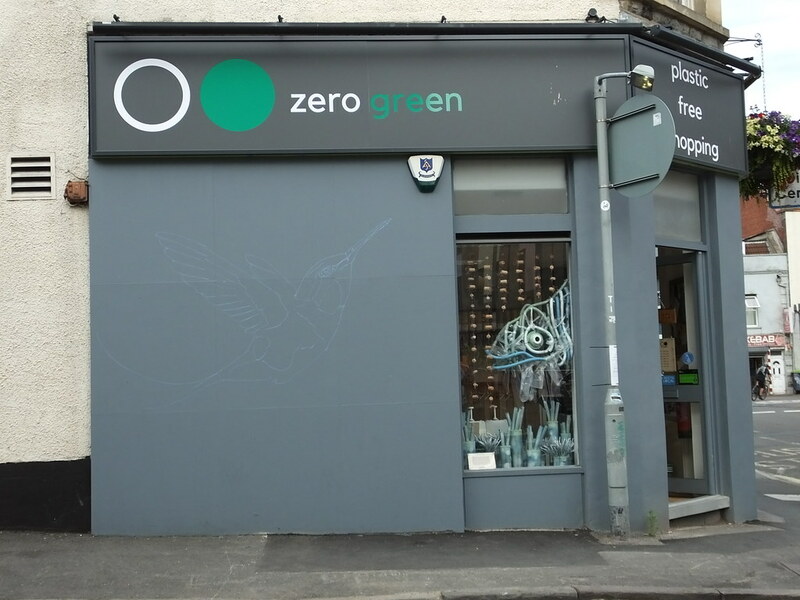 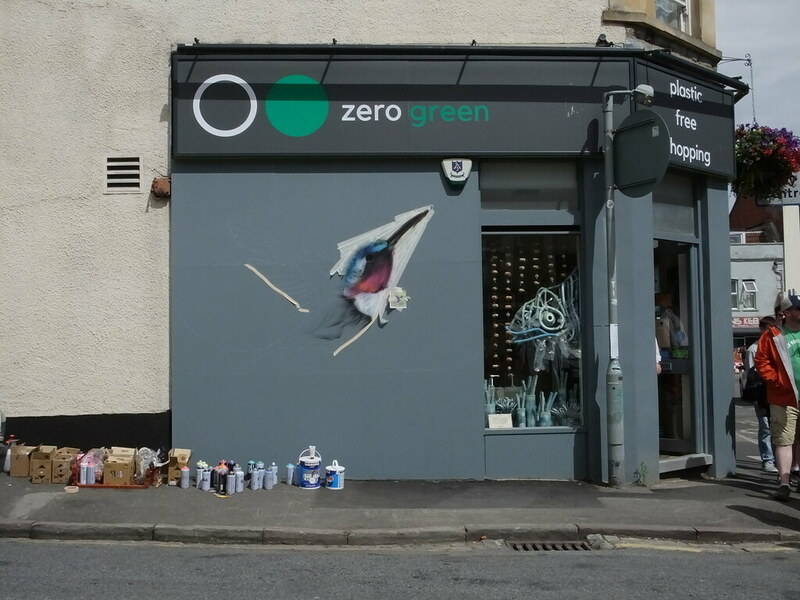 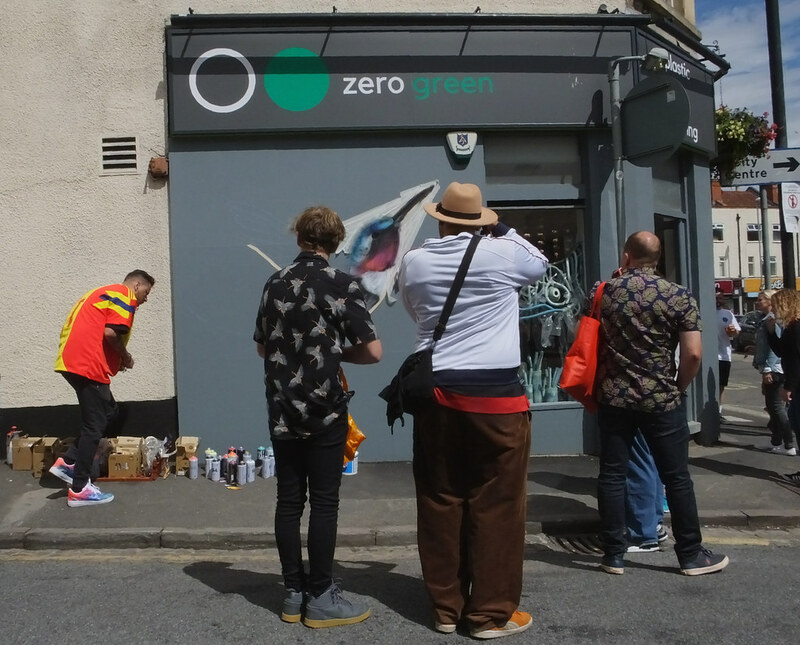 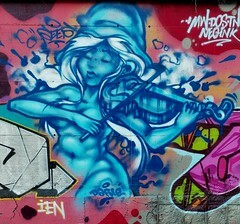 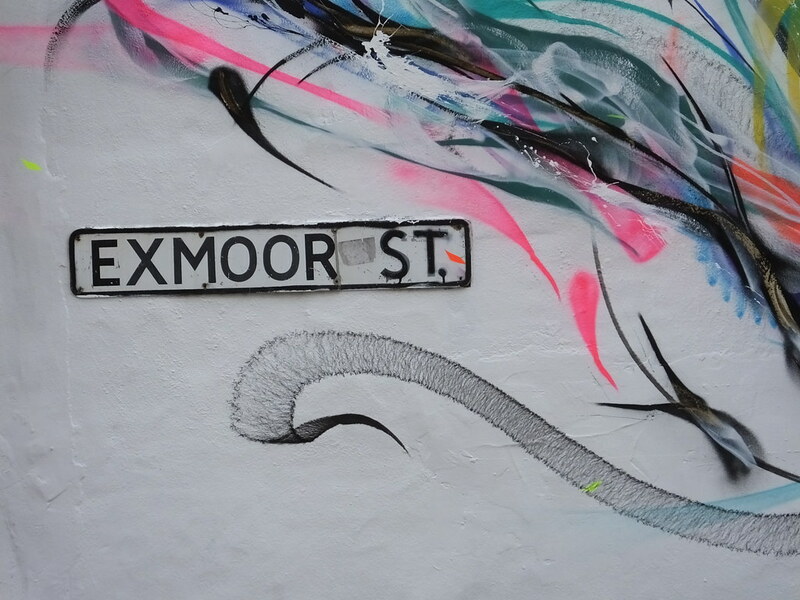 But just a few hundred meters down North Street and some sketches began to appear on the corner of ‘Zero Green’. 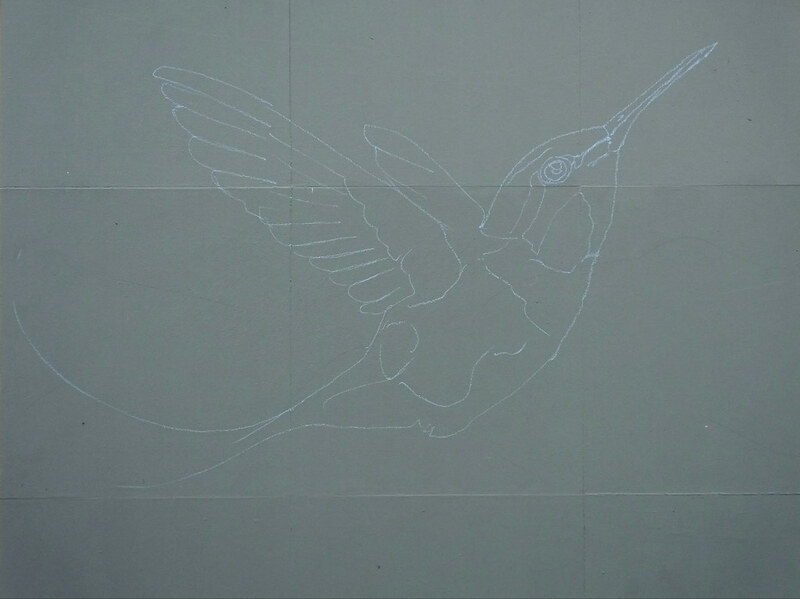 Sketches of another bird were apparent but at this stage it wasn’t fully apparent whom the artist was. 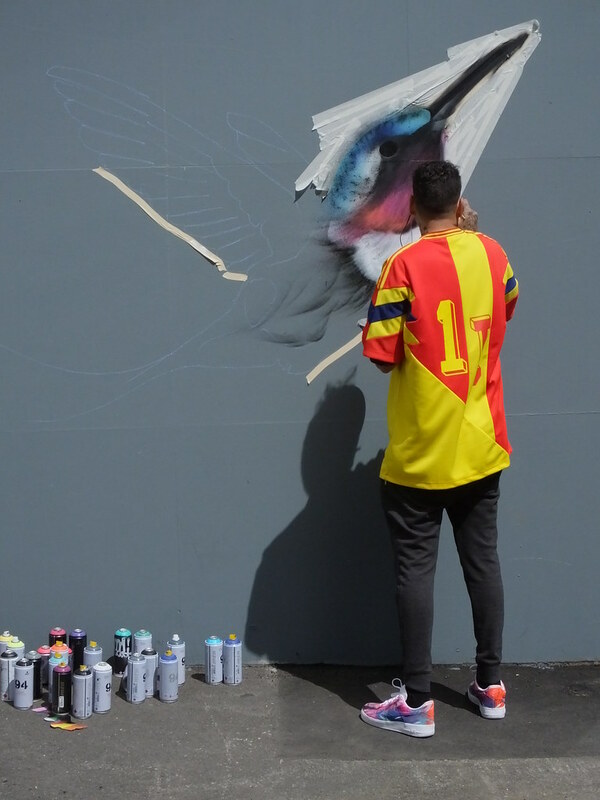 The work wasn’t apparent until L7Matrix turned up to work on his second large mural for Upfest in his familiar striking colours and design. 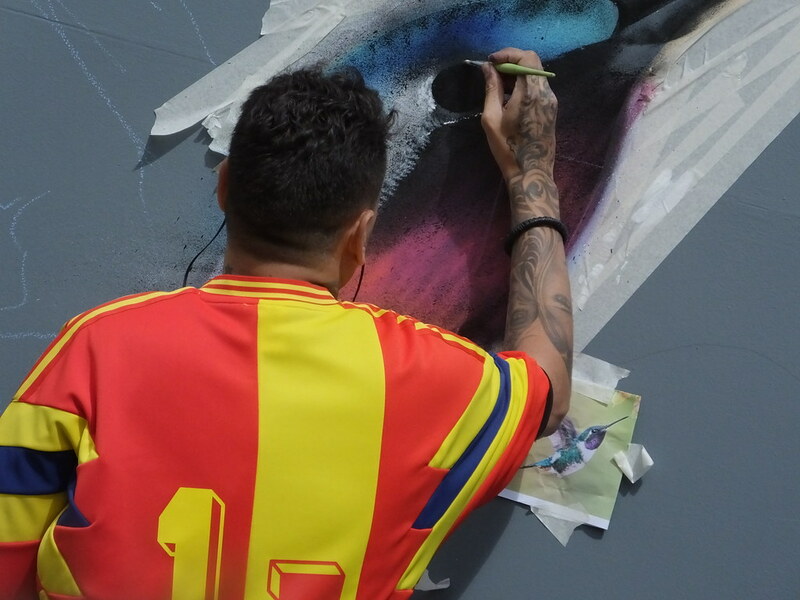 Once again this high profile artist attracted an audience to watch him create another masterpiece. 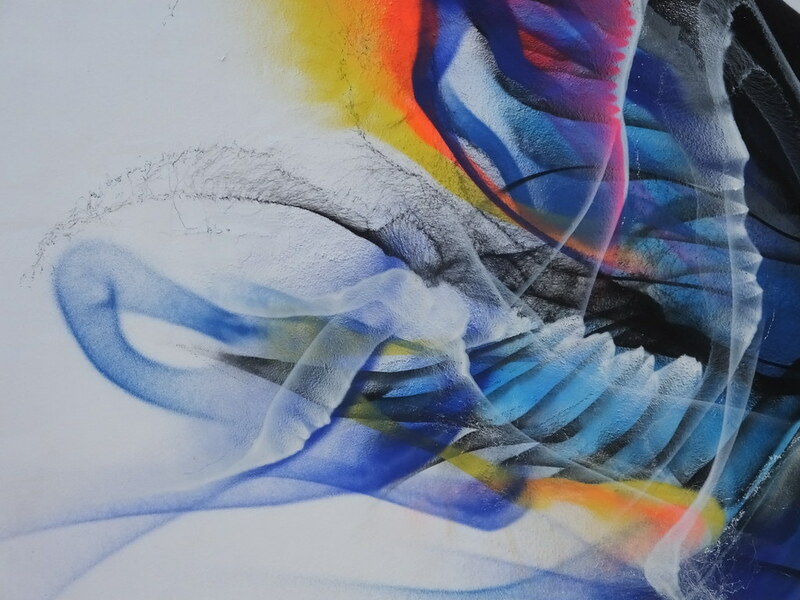 The grey background gives it a totally different feeling to the previous white version. 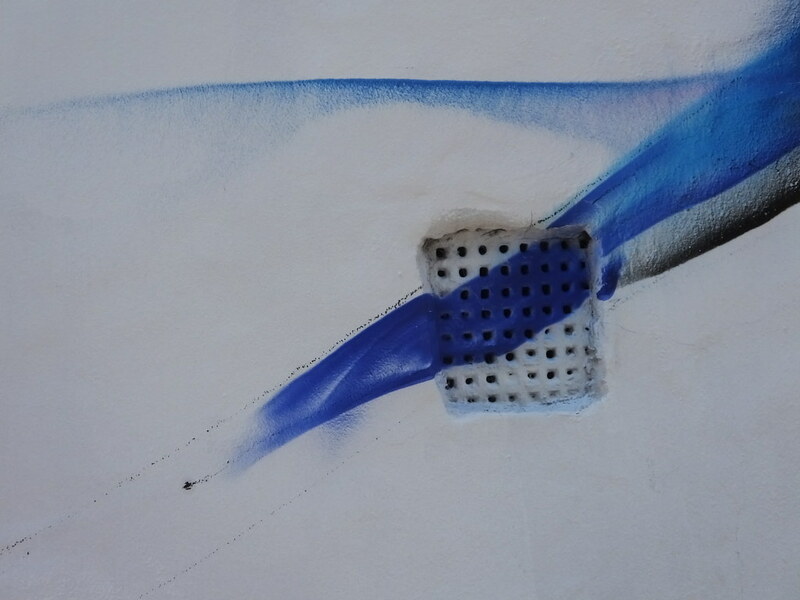 Both pieces almost jump off the wall as you pass but also spill onto the pavements too.